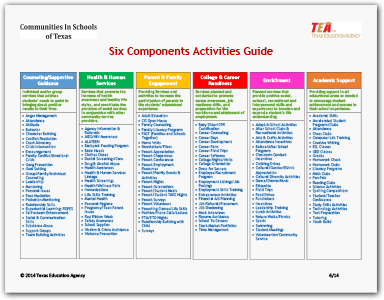 Learn more about the Six Components of the Communities In Schools program. Provide services and activities that increase the participation of parents in their students’ educational experience. Services that promote the increase of physical/mental health and hygiene and coordinate the delivery of social services such as medical and dental care, school supplies and clothing, and other basic needs. 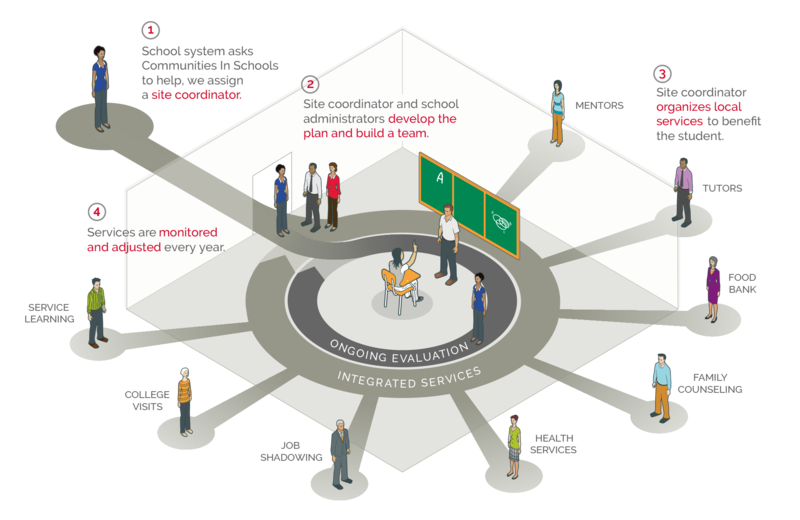 One-on-one and/or group services that address individualize students’ needs. Areas of focus may include attendance, attitude and behavior, mentoring, peer mediation and violence-prevention groups. Services planned and conducted to promote career awareness, college and application processes, financial aid and connections to campus guidance. Services that provide positive social, cultural, recreational and interpersonal experiences to broaden and expand students’ life understanding. Activities may include after-school clubs, computer technology camps, field trips, multicultural programs and social skills training.